It has been a poor year for barramundi fishing thanks to last year’s terrible wet season, and that’s partly why there hasn’t been many posts from us on this site this year. The northern bluewater fishing has taken up the slack, with loads of spanish mackerel, as well as the usual trevally, queenfish, and reef fish. However, another wet season is upon us and it has started well, with heavy rain as early as November. 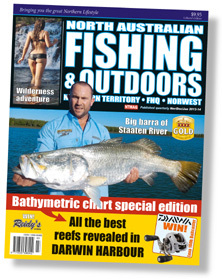 Visit www.fishingterritory.com for the latest barramundi fishing reports from fishos.